The victims of a deadly plane crash in Riverside on Monday have yet to be identified by investigators, but the family of three of the plane's occupants released a statement and photo late Tuesday night to NBC Bay Area. Stacey Pierce was one of two survivors of the crash. She was still in critical condition Tuesday night. Her parents, Nouri and Dana Hijazi, were two of the three people killed in the crash, the family statement indicated. All three are San Jose residents. 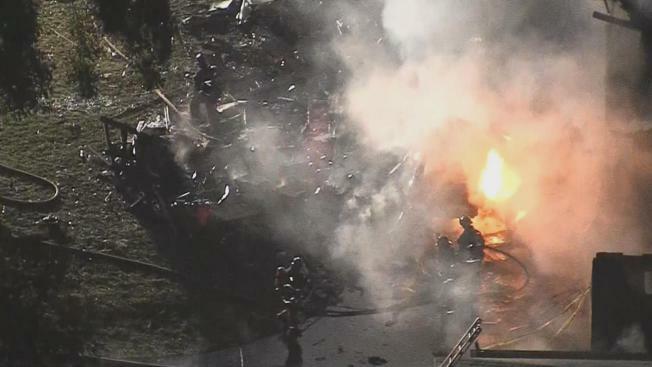 Nouri Hijazi was the registered owner of the Cessna 310 that went down, according to FAA records, and is believed to have been the pilot at the time of the crash. On behalf of our family, we want to say how incredibly devastated and heart broken we are and still trying to process everything. Stacey is still in critical condition. We ask that you continue to pray for her recovery. I know how dedicated she is to her husband and kids and that will give her the strength she needs to fight. Anyone who knows her knows how loving, caring, and outgoing she is and how her laugh can fill a room. Dana, who was Stacey's mom and on board the plane, dedicated her life to Stacey and her four grandchildren, Brandon, Brad, Blaine, and Brooke. She was truly a happy, kind, loving, and warm person and really loved life! Her and Stacey truly were best friends and as close as a mother and daughter could be. Nuri recently retired from a career he loved to spend time with his wife, daughter Stacey and her family. He was an extremely experienced pilot, which was his hobby, his passion. They were devoted to each other and their family, which brought them so much joy. Although I did not know the other passengers, we are praying for her recovery and healing. Our hearts go out to her and her family for the loss of her daughter. We would like to thank the Riverside community; the emergency responders and bystanders who helped in rescuing our family members and did all they could to save them. And thank you to everyone out there for their love, support, thoughts, and prayers for everyone involved. At this time my brother has asked that him and the kids be given privacy to mourn the loss (of) Dana and Nuri and time to be with Stacey through this awful time. And we ask that you continue to pray for everyone involved.